Portable sinks washing station or hand washing station is a portable self contained units which is used for washing hands. Our portable sink washing stations are designed into double or four station units allowing two or four persons wash their hands at a time. Many models are offered to our customers to choose. Depending on customer's requirement they can choose the model. Our portable sink washing stations are adjustable for multipurpose use and portable to any area. Which includes construction areas, agriculture areas, parties, weddings and concert venues. Light weight and easy for moving or transporting. 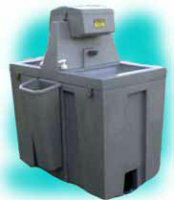 Two persons can easily move our portable sink washing stations. Gives easy replacement flexibility when there is a sudden location change. Using this, sink can be kept adjacent to the restroom or can be moved to another place where needed. Direct rentals service checks quality of every restroom and washing sink before they are delivered. We are focused to increase hygiene and neatness at construction areas and outdoor activities.